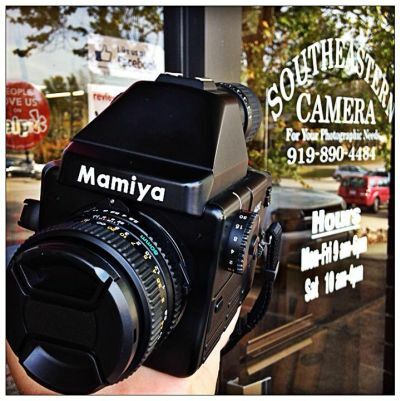 I just got this Mamiya 645E Medium Format Film Camera from Southeastern Camera in Raleigh, North Carolina. Although I no longer do weddings and have NEVER shot a wedding in digital, I did shoot weddings in the 80's on Medium Format film but not with a Mamiya 645. In those days, I used the Mamiya C330 and the Mamiya RB67. The Mamiya 645E was released in 2000. It has several features that I really like compared to the Medium Format Cameras that I used in the 80's: Auto Mode or Manual, Built In Metering, Eye Diopter Adjustment, +/- 2EV Adjustment, Eye Level Viewfinder and a Hotshoe. If you know much at all about the older Medium Format Cameras from the 80's, the 645E has a lot of features built in that you either didn't get, were not an option or you had to pay extra for ( eye level viewfinder ). The build quality does not feel the same as the 645's from the 80's. However, that also makes the Mamiya 645E not weigh as much which can be an advantage when shooting handheld. The negative dimension sizes below will help put Medium Format negative sizes in perspective compared to 35mm. One key thing to keep in mind is getting an 8 x 10 printed from a negative. The larger the negative the less enlargement needed yielding better quality (in theory). Think about Ansel Adams shooting in Large Format on an actual 8 x 10 negative. In this case, no enlargement was needed for an 8 x 10 print. 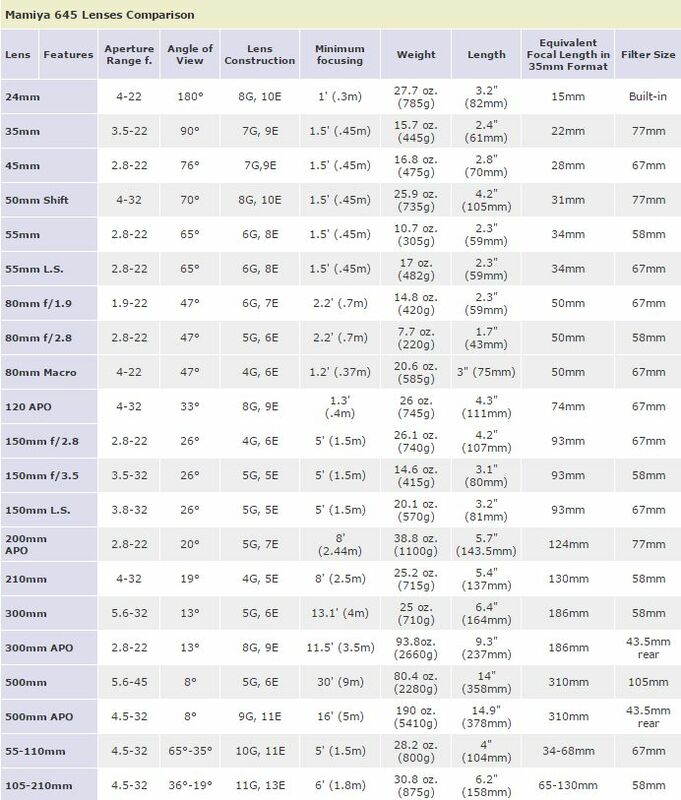 The chart below will give you an idea of equivalent lenses for a 645 Medium Format Camera compared to a 35mm Camera. For example, an 80mm lens on a 645 Medium Format Camera is equivalent to a 50mm lens on a 35mm Camera.